The Naturoville Vedic Retreat is a modern world class luxury vedic retreat in the foothills of Doon valley. The Retreat provides high end health care services on Ayurveda, Yoga, Meditation and Naturopathy. Traditional skills followed back from 5000 years old health science is practiced in the vedic retreat to cater services to guests from India and abroad. Experience the rejuvenation in life with authentic Ayurvedic services combined with naturaly extract ingredients and age old techniques. All amenities in the vedic retreat provides extra comfort in support of the ayurvedic treatment. 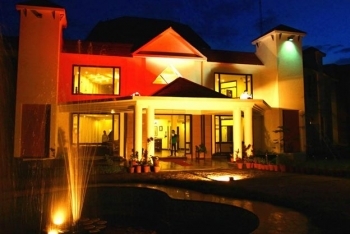 The resort has around 67 Acre property covering lush green gardens and a huge swimming pool. There is a 4 star Ayurveda Center comprising 40 fully equipped Therapy Rooms. Doctors like Dr. Thomas Varghese having experience of more than 20 years in Ayurveda and naturopathy and Dr. Meenakshi Chauhan with therapists from Kerala are expert training in Ayurveda and Naturopathy. Medicines for the therapies comes from Kerala Ayurveda Pharmaceuticals Ltd. Rejuvenate in the ayurveda center Amrita of the world class vedic retreat located amidst tranquil ambience of Himalayas. Total 48 treatment rooms spread in 30000 sq feet area are filled with natures beauty and luxury for speed up the process of healing. Guests from Indian and abroad suffering from prolonged ailments have gained from Amrita Ayurveda Center. Treatements like Panchkarma and Naturopathy are given in the separate rooms. Experience therapists conduct authentic treatments with modern equipments. There are mud therapy rooms, Ozone therapy cabins, Jacuzzi with colour therapy, Steam & Sauna, Whirl pools and Detox cabins. A spa therapy section and Ayurvedic medicine & Cosmetic shop offers some leisure time in between the treatment schedule. A modern yoga center with world class amenities Aatma Yoga Center is setup in the Naturoville Vedic Retreat. It offers yoga science and techniques in the air conditioned and wooden floored facility. The yoga center is spread across 2500 sq ft and led by world renowned teacher and guru Acharya Ganga Ramji. 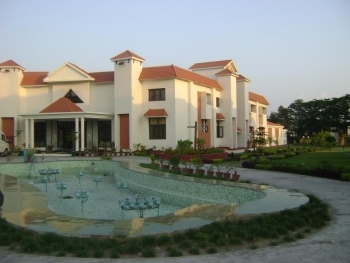 Naturoville Vedic Retreat is located on Dehradun - Haridwar Road near Fun Valley on Lal Tappar. Dehradun, Rishikesh and Haridwar are at a distance of 25 kms, 15 kms and 22 kms respectively. The Vedic Retreat offers comfortable air-conditioned accommodation of 32 room which includes 28 Deluxe rooms and 04 Executive Suites. The Naturoville Vedic Retreat Resort has a multi cuisine restaurant Prana offering healthy food cooked with ayurvedic ingredients. Expert chefs takes care of individual diet plan (ayurvedic) for detoxification of body. The restaurant also serves food based on buffet. There is a pool lounge where guests can relax and order light snacks and beverages. The vedic retreat is the home of health and fitness with Ayurveda and Yoga science. It also offers many activities such as wellness gym, swimming pool, Indoor games (table tennis, billiards), Outdoor games (ricket, badminton). Guests can also enjoy bi-cycle ride and sightseeing tours to Rishikesh, Dehradun, Mussoorie and Rajaji National Park. Village tour and white water rafting will be arrange in request. 3 Nights/4 Days Extended Weekend Package 20,999/24,999 - Traditional Welcome + Welcome drink on arrival. - Room + Breakfast + Dinner. - 45 minutes traditional Kerala massage with Steam or Sauna for a couple (Twice). - Yoga in the morning & Meditation in the evening. - Usage of Swimming Pool / Multi Specialty Gym (unlimited). - Usage of Indoor & Outdoor recreations (unlimited). 2 Nights/3 Days Getaway Package 14,999/18,999 - Traditional Welcome + Welcome drink on arrival. - Steam & Sauna for couple. - Yoga & Meditation sessions. - Complimentary consultation with Ayurveda Physician. - Guided Nature Walk & Bicycle Tours. 2 Nights/3 Days Saatva Package 18,499/22,499 - Traditional Welcome + Welcome drink on arrival. - 45 minutes traditional Kerala massage with Steam or Sauna for a couple (Once). -Accommodation in A/c Deluxe Room/Executive Suite on Single/Twin Sharing basis. -Tea/Coffee maker in the Room. -Initial, Daily & Final Consultation with our team of Doctors. -NaturOville wake- up signature Tea / Coffee. -Breakfast, Lunch & Dinner (as per individual diet plan). -Daily Yoga & Meditation sessions. -Usage of Recreational Area, Indoor & Outdoor Games. -Usage of Wellness gym and swimming pool. Nearest airport is Jolly Grant Airport, Dehradun located at 12 kms from Naturoville Vedic Retreat. There are many Domestic flights between New Delhi & Jolly Grant Airport, Dehradun - New Delhi by Air India / Jet Airways / King Fisher / Spice Jet. Haridwar railway station is the major railway station nearest to the vedic retreat located at 22 kms only. Haridwar is well connected by rail network and major trains like Superfast Shatabdi and Jan Shatabdi Trains (runs everyday from Delhi and other major cities. The Naturoville Vedic Retreat is at 233 km from Delhi via Haridwar and takes about 7 hrs by road.